Even with notable Republican support, a divided Colorado legislature couldn’t put a “red flag” bill on Gov. John Hickenlooper’s desk in 2018. But this upcoming session, with complete control of the House, Senate and governor’s seat, it’s near-certain the gun measure will be back and face little resistance following the state’s “blue wave” of elected Democrats. 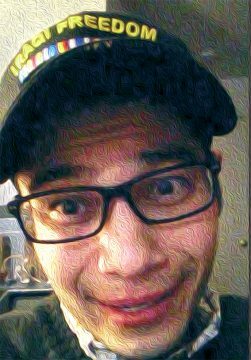 Background art: Matthew Riehl broadcast rambling video on Periscope before he began shooting at sheriff deputies in Highlands Ranch, killing Deputy Zackari Parrish. Last year, lawmakers attempted to make Colorado the ninth state in the country to enact so-called “red flag” legislation, which generally allows authorities to temporarily seize the firearms of people deemed imminently dangerous to themselves or others. Since Connecticut became the first state to pass a “red flag” bill in 1999, a total of 13 states have inked such laws in their books. The recent Colorado measure passed in the State House but was blocked by state Senate Republicans in committee. The proposed bill sought to grant law enforcement officials and family members the ability to petition courts to seek “extreme risk protection orders,” which would strip weapons from people deemed to be a threat. Officials or family members seeking such civil orders would have to make their case at a court hearing. If a judge believed the person referenced in an order to be a threat, an initial ERPO would be imposed for seven days, according to the legislative summary of the bill. If the person is still determined to be dangerous in subsequent hearings, the order could be extended for up to 182 days. The person whom the order is filed against would be afforded one appeal throughout the course of the ERPO, according to the bill summary. If the order expires or is tossed out by a court due to lack of proof, the person targeted in the order would be able to get their weapons back. Proponents of the legislation say it’s more about safety and a person’s behavior than it is about diminishing Second Amendment rights or the “gun grabbing” rhetoric from dissenters. Buzz about the bill has already begun, and Democrats are optimistic that it will appear early on in the session, which starts in January and runs into May. Rep.-elect Tom Sullivan, who’s been a mainstay at the state capitol during gun legislation hearings, said he wants the bill to appear early on so the public can have more time with it and legislators can make it thorough. Sullivan’s son Alex died in the Aurora theater shooting in 2012. That prompted the now-lawmaker to testify for stricter gun laws the following year. Last year he wasn’t part of the discussion on “red flag” legislation, but this year he wants to have his name attached to it. It’s so far unclear who among Democrats will lead the charge on that measure. 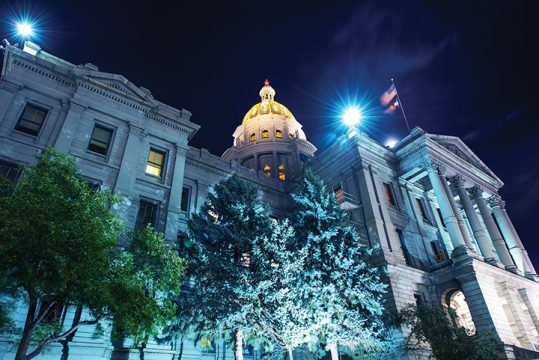 To shepherd last year’s failed “red flag” bill — HB 1436 — through committee, a CeaseFire Colorado lobbyist worked closely with Democrats and Republican House member Cole Wist, who lost to Sullivan in November. The organization’s director Eileen McCarron told the Sentinel proponents have been working on wording of the legislation for more than two years. It started with a 2016 consortium about the topic. Sullivan, McCarron and others agree the topic, though made to be, isn’t political. “A gunman didn’t walk into the theater that night and only kill Democrats’ kids,” Sullivan said. Law enforcement has also come to support the extreme risk protection order legislation. State legislators will once again vote on a proposed red-flag bill that aims to limit gun-related violence and mass shootings. At the Arapahoe County Sheriff’s Office, members of the old and new guard from both sides of the aisle have voiced their support for the legislation. Sheriff Dave Walcher was one of the several Republicans who made the trek down to the state Capitol last spring to speak in favor of Wist’s failed bill. He said he was swayed to support the measure following multiple police fatalities in Colorado jurisdictions at the hands of mentally unstable people last year. “I want law abiding citizens to have guns if they want them, but I don’t like crooks having guns and I think people having mental health, not just challenges, but mental health emergencies — we need to do something to get guns out of their hands,” Walcher said in September. Walcher, who has several decades of experience across Front Range law enforcement agencies, said he was at the scene shortly after Douglas County Deputy Zack Parrish, 29, was shot and killed by Matthew Riehl, a gunman who was suffering from PTSD last New Year’s Eve. “That, to me, was one of those incidents that there’s all these red flags, there’s all these warning signs,” he said. Lawmakers memorialized Parrish when naming last year’s attempted legislation: the proposal was officially deemed the Deputy Zackari Parrish III Violence Prevention Act. Shortly after Parrish was killed, Walcher said his own officers arrested a man in an apartment near Parker Road and East Florida Avenue who displayed similar behavior as the gunman who killed Parrish. After establishing probable cause, Walcher’s officers executed an arrest warrant and apprehended the man without incident. Upon searching the suspect’s home, Walcher said officers found nearly 10 guns — including pistols, rifles and shotguns — all loaded and staged throughout the apartment in unincorporated Arapahoe County. Democrat Tyler Brown, the Arapahoe County Sheriff-elect, said he also supports red flag legislation. “I think that the use of those red flag laws would be a great resource and tool for law enforcement,” Brown said in a pre-election interview earlier this fall. Republican Douglas County Sheriff Tony Spurlock also spoke in favor of last session’s bill. Rick Reigenborn, the democratic sheriff-elect in Adams County, said he is “in 100-percent support” of “red flag” legislation. A spokesman for the Aurora Police Department said the department does not comment on pending or potential state legislation. 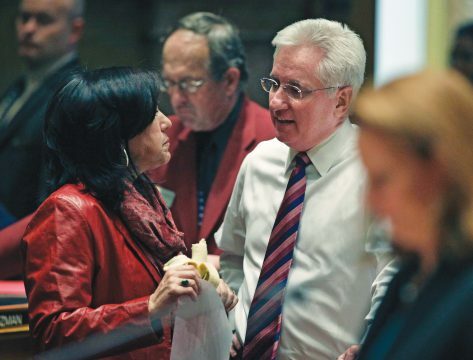 Last year the legislation found an ally in 18th Judicial District Attorney George Brauchler, who had a failed bid for state attorney general this year. Through the election he continued to voice his support. Now, he says he’ll have to vet a new bill before taking an official stance. This year, supporters of the measure say even with the votes, they’ll carry the bill differently. The legislation, which is law in other states, only recently came to be known as “red flag.” McCarron said she didn’t hear that messaging until a shooting took place in a Parkland, Florida, high school. That’s how the legislation was named in Colorado last year. And it’s how Sullivan refers to the legislation. McCarron said it’s also important to emphasize the legislation’s intent. “The other thing is that we always want to stress that this is not — and I hear this all the time — it’s not necessarily about mental illness, it’s about people who are dangerous to others or themselves,” she said. Jessica Price, a co-founder of the Aurora chapter of Moms Demand Action group, said she and the chapter worked hard to get people, like Sullivan, elected to carry “red flag” bills — not just to prevent more mass shootings, but to protect people who may commit suicide. And while the future looks brighter for ERPO legislation, Price said she sees the importance of garnering support from across the political spectrum. Andrew Romanoff, president and CEO of Mental Health Colorado, urged holdouts to act instead of waiting for a cure-all. Citing a commitment from Democratic Governor-elect Jared Polis to sign a future red flag bill, Romanoff said he’s optimistic a proposal will make its way to Polis’ desk next spring. But until a measure legalizing ERPOs successfully worms its way out of the legislature with bicameral approval, people who could benefit from the court orders will continue to die, Romanoff said. Nearly 1,200 people died by suicide across the state last year, Romanoff said. More than half of those people used a firearm to kill themselves. When Democrats forged ahead and passed stricter gun legislation in 2013, two Democratic state senators were recalled for their votes on magazine limits and universal background checks. Former state Sens. Angela Giron, of Pueblo, and John Morse, of Colorado Springs, attracted national media attention when they were accused of not representing the moderate and gun-friendly stances in their constituency. But in 2018, Democrats are emboldened by the outcome of the midterm elections and don’t see a recall repeat ahead. Partisan money came to the aid of both ends of the spectrum in 2013. The National Rifle Association was suspected to have funneled money into the effort and Michael Bloomberg dropped $300,000 straight to Giron and Morse for support. Rocky Mountain Gun Owners took a strong stance on the legislation, ultimately campaigning against former Rep. Cole Wist, the Centennial Republican who co-sponsored the extreme risk protection bill last session and fell to Sullivan this November, and Arapahoe County District Attorney George Brauchler and his support of the bill. 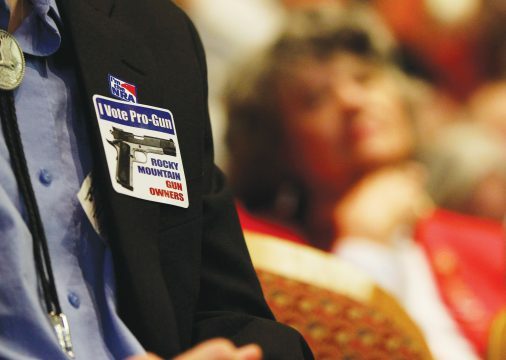 “So-called ‘red flag’ gun confiscation laws are designed to strip law-abiding citizens of Second, Fourth and Fifth Amendment rights by mere accusation from an anti-gun family member, friend, ex-partner, or just about anyone,” RMGO director Dudley Brown wrote in an email to supporters prior to the election, urging readers to contact Wist and Brauchler about their stances on the legislation. Both politicians lost their bids for state seats — Brauchler for attorney general and Wist for his state house seat — to competitors that also support the legislation. RMGO did not respond to a request for comment. Despite local pushback from the RMGO, the National Rifle Association has slowly warmed to certain versions of “red flag” bills across the country. In March, the NRA released a video encouraging congress to fund risk protection orders. This article has been updated to include the correct spelling for Eileen McCarron of Colorado CeaseFire. Article originally appeared in the Aurora Sentinel.